Hard water leaves behind deposits of calcium and other minerals that can corrode pipes and fixtures, make laundry dingy and form rings in the bathtub. If your home has hard water, one way to make it soft is to install a soft water system. If you are renting or must use a Laundromat that has hard water, installing a water softener is not an option. 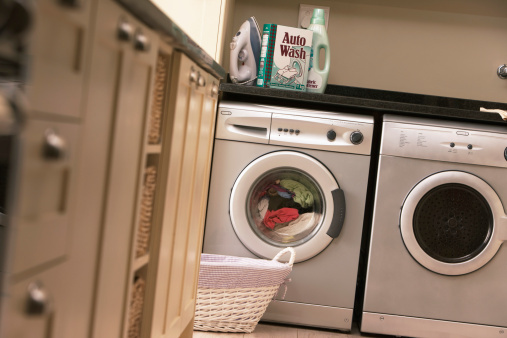 Luckily, you can still soften your laundry water without relying on a water softener. Rinse and wash an empty plastic milk jug. Rinse well to remove all milk residue and soap. Add washing soda and borax to the clean milk jug. Insert a funnel into the container and pour in 1/2 lb. washing soda and 1/4 lb. borax. Fill the jug half way with warm water and secure with the lid. Shake the jug to blend and mix the ingredients, holding on the lid so the mixture doesn't splash out the top of the jug. Fill the bottle the rest of the way with warm water, and shake to mix, making sure the washing soda and borax fully dissolve in the water. Add 1 cup of the solution to each load of laundry. Use your laundry detergent as you would normally.